Photo album of Incrediable India!! It is the most important fort in India. The great Mughals Babur, Humayun, Akbar, Jehangir, Shah Jahan and Aurangzeb lived here, and the country was governed from here. It contained the largest state treasury and mint. It was visited by foreign ambassadors, travellers and the highest dignitaries who participated in the making of history in India. This was originally a brick fort and the Sikarwar Rajputs held it. It was mentioned for the first time in 1080 AD when a Ghaznavide force captured it. Sikandar Lodi (1487-1517) was the first Sultan of Delhi who shifted to Agra and lived in the fort. He governed the country from here and Agra assumed the importance of the 2nd capital. He died in the fort in 1517 and his son, Ibrahim Lodi, held it for nine years until he was defeated and killed at Panipat in 1526. Several palaces, wells and a mosque were built by him in the fort during his period. After Panipat, Mughals captured the fort and a vast treasure - which included a diamond that was later named as the Koh-i-Nor diamond - was seized. Babur stayed in the fort in the palace of Ibrahim. He built a baoli (step well) in it. Humayun was crowned here in 1530. Humayun was defeated in Bilgram in 1530. Sher Shah held the fort for five years. The Mughals defeated the Afghans finally at Panipat in 1556. Realizing the importance of its central situation, Akbar decided to make it his capital and arrived in Agra in 1558. His historian, Abdul Fazal, recorded that this was a brick fort known as 'Badalgarh'. It was in a ruined condition and Akbar had it rebuilt with red sandstone. Architects laid the foundation and it was built with bricks in the inner core with sandstone on external surfaces. Some 1,444,000 builders worked on it for eight years, completing it in 1573. It was only during the reign of Akbar's grandson, Shah Jahan, that the site finally took on its current state. The legend is that Shah Jahan built the beautiful Taj Mahal for his wife, Mumtaz Mahal. Unlike his grandfather, Shah Jahan tended to have buildings made from white marble, often inlaid with gold or semi-precious gems. He destroyed some of the earlier buildings inside the fort in order to make his own. At the end of his life, Shah Jahan was imprisoned by his son, Aurangzeb, in the fort, a punishment which might not seem so harsh, considering the luxury of the fort. It is rumored that Shah Jahan died in Muasamman Burj, a tower with a marble balcony with an excellent view of the Taj Mahal. This was also a site of one of the battles during the Indian rebellion of 1857, which caused the end of the British East India Company's rule in India, and led to a century of direct rule of India by Britain. Inside the Musamman Burj, where Shah Jahan spent the last seven years of his life under house arrest by his son Aurangzeb. The fort has a semi-circular plan, its chord lying parallel to the river. Its walls are seventy feet high. Double ramparts have massive circular bastions are regular intervals as also battlements, embrasures, machicolations and string courses. Four gates were provided on its four sides, one Khizri gate opening on to the river. Two of the fort's gates are notable: the 'Delhi Gate' and the 'Lahore Gate.' The Lahore Gate is also popularly also known as the Amar Singh Gate, for Amar Singh Rathore. The monumental Delhi Gate, which faces the city on the western side of the fort, is considered the grandest of the four gates and a masterpiece of Akbar's time. It was built circa 1568 both to enhance security and as the king's formal gate, and includes features related to both. It is embellished with inlay work in white marble, proof to the richness and power of the Great Mughals. A wooden drawbridge was used to cross the moat and reach the gate from the mainland; inside, an inner gateway called Hathi Pol ('Elephant Gate') - guarded by two life sized stone elephants with their riders - added another layer of security. The drawbridge, slight ascent, and 90 degree turn between the outer and innter gates, make the entrance impregnable. During a siege, attackers would employ elephants to crush a fort's gates. Without a level, straight run-up to gather speed, however, something prevented by this layout, elephants are ineffective. Because the Indian military (the Parachute Brigade in particular) is still using the northern portion of the Agra Fort, the Delhi Gate cannot be used by the public. Tourists enter via the Lahore Gate so named because it faces Lahore, now in Pakistan. The site is very important in terms of architectural history. Abul Fazal recorded that five hundred buildings in the beautiful designs of Bengal and Gujarat were built in the fort. Some of them were demolished to make way for his white marble palaces. Most of the others were destroyed by the British between 1803 and 1862 for raising barracks. Hardly thirty Mughal buildings have survived on the south-eastern side, facing the river. Of these, the Delhi Gate and Akbar Gate and one palace - 'Bengali Mahal' - are representative Akbari buildings. Akbar Gate Akbar Darwazza was renamed Amar Singh Gate by Jahangir. The gate is similar in design to the Delhi Gate. Both are built of red sandstone. The Bengali Mahal is also built of red sandstone and is now split into Akbari Mahal and Jahangiri mahal. Some of the most historically interesting mixing of Hindu and Islamic architecture are found here. In fact, some of the Islamic decorations feature haraam (forbidden) images of living creatures - dragons, elephants and birds, instead of the usual patterns and calligraphy seen in Islamic surface decoration. * The Agra Fort has won the Aga Khan Award for Architecture in the year 2004. * India Post has issued a Stamp to commemorate this prestigious Aga Khan Award on 28.11.2004. * Agra Fort should not be confused with the much smaller Red Fort at Delhi. The Mughals never referred the Red Fort as a fort; rather, it was referred as the 'Lal Haveli', or the Red Bungalow. The Prime Minister of India addresses the nation from Red Fort at Delhi on August 15, India's Independence Day. * The Agra Fort plays a key role in the Sherlock Holmes mystery The Sign of the Four, by Sir Arthur Conan Doyle. * The Agra Fort was featured in the music video for Habibi Da, a hit song of Egyptian pop star Hisham Abbas. * Shivaji came to Agra in 1666 as per the 'Purandar Treaty' entered into with Mirza Raje Jaisingh to met Aurangzeb in the Diwan-i-Khas. In the audience he was deliberately placed behind men of lower rank, Insulted he stormed out of the imperial audience and was confined to Jai Sing's quarters on 12 May 1666. Fearing the dungeons and execution, in a famously sweet legend, he escaped on 17 August 1666. A heroic equestrian statue of Shivaji has been erected outside the fort. * In the second expansion pack for Age of Empires 3, the Asian Dynasties, Agra fort is one of five wonders for the Indian civilization to advance to the next age. Once built, it sends player a shipment of coin. This wonder acts as a Fortress, with an attack (though weaker than European versions) and the ability to train infantry and cavalry units. * In the game 'Rise of Nations' the Red Fort can be built by players as a wonder. The Red Fort acts just like a normal castle/fortress/redoubt. But has the ability to heal troops garrisoned inside by 500%, and is also resistant to air attacks. Attack range is also longer, and certain unit upgrades are gained automatically, at no cost. Shahab-ud-din Muhammad Shah Jahan I (full title: Al-Sultan al-'Azam wal Khaqan al-Mukarram, Abu'l-Muzaffar Shihab ud-din Muhammad, Sahib-i-Qiran-i-Sani, Shah Jahan I Padshah Ghazi Zillu'llah Firdaus-Ashiyani) (also spelled Shah Jehan, Shahjehan. Urdu: شاه ‌جہاں), (January 5, 1592 – January 22, 1666) was the ruler of the Mughal Empire in the Indian subcontinent from 1628 until 1658. The name Shah Jahan comes from Persian meaning 'King of the World.' He was the fifth Mughal ruler after Babur, Humayun, Akbar, and Jahangir. While young, he was a favourite of Akbar. Even while very young, he could be pointed out to be the successor to the Mughal throne after the death of Jahangir. He succeeded to the throne upon his father's death in 1627. He is considered to be one of the greatest Mughals and his reign has been called the Golden Age of Mughals. Like Akbar, he was eager to expand his empire. The chief events of his reign were the destruction of the kingdom of Ahmadnagar (1636), the loss of Kandahar to the Persians (1653), and a second war against the Deccan princes (1655). In 1658 he fell ill, and was confined by his son Aurangzeb in the citadel of Agra until his death in 1666. On the eve of his death in 1666, the Mughal Empire spanned almost 750,000,000 acres (3,000,000 km2), about 9/10 the size of modern India. The period of his reign was the golden age of Mughal architecture. Shah Jahan erected many splendid monuments, the most famous of which is the Taj Mahal at Agra built as a tomb for his wife Mumtaz Mahal (birth name Arjumand Banu Begum). The Pearl Mosque at Agra and the palace and great mosque at Delhi also commemorate him. The celebrated Peacock Throne, said to be worth millions of dollars by modern estimates, also dates from his reign. He was the founder of Shahjahanabad, now known as 'Old Delhi'. The important buildings of Shah Jahan were the Diwan-i-Am and Diwan-i-Khas in the fort of Delhi, the Jama Masjid, the Moti Masjid and the Taj. It is pointed out that the Palace of Delhi is the most magnificent in the East. Shah Jahan was born as Prince Khurram Shihab-ud-din Muhammad, in 1592 in Lahore as the third and favorite son of the emperor Jahangir, his mother being a Rathore Rajput Princess, known as Princess Manmati who was Jahangir's wife. The name Khurram - Persian for 'joyful' - was given by his grandfather Akbar. His early years saw him receive a cultured, broad education and he distinguished himself in the martial arts and as a military commander while leading his father's armies in numerous campaigns - Mewar (1615 CE, 1024 AH), the Deccan (1617 and 1621 CE, 1026 and 1030 AH), Kangra (1618 CE, 1027AH). He was responsible for most of the territorial gains during his father's reign. He also demonstrated a precocious talent for building, impressing his father at the age of 16 when he built his quarters within Babur's Kabul fort and redesigned buildings within Agra fort. In 1607 CE (1025 AH) Khurrum was to marry Arjumand Banu Begum, the grand daughter of a Persian noble, who was just 14 years old at the time. She would become the unquestioned love of his life. They would, however, have to wait five years before they were married in 1612 CE (1021 AH). After their wedding celebrations, Khurram 'finding her in appearance and character elect among all the women of the time,' gave her the title Mumtaz Mahal (Jewel of the Palace). The intervening years had seen Khurrum take two other wives known as Akbarabadi Mahal (d.1677 CE, 1088 AH), and Kandahari Mahal (b. c1594 CE, c1002 AH), (m.1609 CE, 1018 AH). By all accounts however, Khurrum was so taken with Mumtaz, that he showed little interest in exercising his polygamous rights with the two earlier wives. Inheritance of power and wealth in the Mughal empire was not determined through primogeniture, but by princely sons competing to achieve military successes and consolidating their power at court. This often led to rebellions and wars of succession. As a result, a complex political climate surrounded the Mughal court in Khurram's formative years. In 1611 his father married Nur Jahan, the widowed daughter of a Persian immigrant. She rapidly became an important member of Jahangir's court and, together with her brother Asaf Khan, wielded considerable influence. Arjumand was Asaf Khan's daughter and her marriage to Khurrum consolidated Nur Jahan and Asaf Khan's positions at court. Khurram's intense military successes of 1617 CE (1026 AH) against the Lodi in the Deccan effectively secured the southern border of the empire and his grateful father rewarded him with the prestigious title 'Shah Jahan Bahadur' (Lord of the World) which implicitly sealed his inheritance. Court intrigues, however, including Nur Jahan's decision to have her daughter from her first marriage wed Shah Jahan's youngest brother and her support for his claim to the throne led Khurram, supported by Asaf Khan, into open revolt against his father in 1622. The rebellion was quelled by Jahangir's forces in 1626 and Khurram was forced to submit unconditionally. Upon the death of Jahangir in 1627, Khurram succeeded to the Mughal throne as Shah Jahan, King of the World and Lord of the Auspicious Conjunctions, the latter title alluding to his pride in his Timurid roots. Despite her frequent pregnancies, Mumtaz Mahal travelled with Shah Jahan's entourage throughout his earlier military campaigns and the subsequent rebellion against his father. Mumtaz Mahal was utterly devoted — she was his constant companion and trusted confidante and their relationship was intense. She is portrayed by Shah Jahan's chroniclers as the perfect wife with no aspirations to political power. This is in direct opposition to how Nur Jahan had been perceived. Although his father's rule was generally peaceful, the empire was experiencing challenges by the end of his reign. Shah Jahan reversed this trend by putting down a Islamic rebellion in Ahmednagar, repulsing the Portuguese in Bengal, capturing the Rajput kingdoms of Baglana and Bundelkhand to the west and the northwest beyond the Khyber Pass. Shah Jahan's military campaigns drained the imperial treasury. Under his rule, the state became a huge military machine and the nobles and their contingents multiplied almost fourfold, as did the demands for more revenue from the peasantry. It was however a period of general stability - the administration was centralised and court affairs systematised. Historiography and the arts increasingly became instruments of propaganda, where beautiful artworks or poetry expressed specific state ideologies which held that central power and hierarchical order would create balance and harmony. The empire continued to expand moderately during his reign but the first signs of an imperial decline were seen in the later years. His political efforts encouraged the emergence of large centres of commerce and crafts - such as Lahore, Delhi, Agra, and Ahmedabad - linked by roads and waterways to distant places and ports. He moved the capital from Agra to Delhi. Under Shah Jahan's rule, Mughal artistic and architectural achievements reached their zenith. Shah Jahan was a prolific builder with a highly refined aesthetic. He built the legendary Taj Mahal in Agra as a tomb for his beloved wife, Mumtaz Mahal. Among his other surviving buildings are the Red Fort and Jama Masjid in Delhi, the Shalimar Gardens of Lahore, sections of the Lahore Fort (such as Sheesh Mahal, and Naulakha pavilion), and his father's mausoleum. Legend has it that Shah Jahan wanted to build a black Taj Mahal for himself, to match the white one he reportedly loved much more. There is no reputable scholarship to support this hypothesis, however. It is believed that Shah Jahan cut the hand of the chief architect who built Taj Mahal thinking another such Taj Mahal will never be built again. His son Aurangzeb led a rebellion when Shah Jahan became ill in 1657 CE (1067 AH) and publicly executed his brother and the heir apparent Dara Shikoh. Although Shah Jahan fully recovered from his illness, Aurangzeb declared him incompetent to rule and put him under house arrest in Agra Fort. Jahanara Begum Sahib voluntarily shared his 8-year confinement and nursed him in his dotage. In January of 1666 CE (1076 AH), Shah Jahan fell ill with strangury and dysentery. Confined to bed, he became progressively weaker until, on January 22, he commanded the ladies of the imperial court, particularly his consort of later years Akbarabadi Mahal, to the care of Jahanara. After reciting the Kalima and verses from the Qu'ran, he died. Jahanara planned a state funeral which was to include a procession with Shah Jahan's body carried by eminent nobles followed by the notable citizens of Agra and officials scattering coins for the poor and needy. Aurangzeb refused to accommodate such ostentation and the body was washed in accordance with Islamic rites, taken by river in a sandalwood coffin to the Taj Mahal and was interred there next to the body of his beloved wife Mumtaz Mahal. Shah Jahan's legacy was one of the most profound of all the Mughals. A patron of the fine arts, he continued the Mughal patronage of painting, although his passion was architecture, with the highlight being undoubtedly the Taj Mahal. Painting during his reign reflected the serene prosperity that the Mughals enjoyed with many scenes reflecting Shah Jahan's interest in romance. Shah Jahan has left behind a grand legacy of structures constructed during his reign. The most famous of these is the Taj Mahal in Agra built to hold the tomb for his favorite wife, Mumtaz Mahal. Upon his death, his son Aurangazeb had him interred in it next to Mumtaz Mahal. Among his other constructions are Delhi Fort also called the Red Fort or Lal Quila (Urdu) in Delhi, large sections of Agra Fort, the Jama Masjid (Grand Mosque), Delhi, the Wazir Khan Mosque, Lahore, Pakistan, the Moti Masjid (Pearl Mosque), Lahore, the Shalimar Gardens in Lahore, sections of the Lahore Fort, Lahore, the Jahangir mausoleum - his father's tomb, the construction of which was overseen by his stepmother Nur Jahan and the Shahjahan Mosque, Thatta, Pakistan. He also had the Peacock Throne, Takht e Taus, made to celebrate his rule. There is a crater named after Shah Jahan on the asteroid 433 Eros. Craters on Eros are named after famous fictional and real-life lovers. Like all his ancestors, Shah Jahan's court included many wives, concubines, and dancing girls. Several European chroniclers have noted this. Niccolao Manucci wrote that 'it would seem as if the only thing Shah Jahan cared for was the search for women to serve his pleasure' and 'for this end he established a fair at his court. No one was allowed to enter except women of all ranks that is to say, great and small, rich and poor, but all beautiful.' When he was detained in the Red Fort at Agra, Aurangzeb permitted him to retain 'the whole of his female establishment, including the singing and dancing women.' Manucci notes that Shah Jahan didn't lose his 'weakness for the flesh' even when he had grown very old. However, most of the European travellers in India had access to such information primarily through bazaar gossip and not first hand. 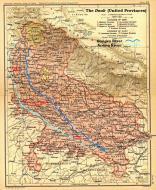 Most of the empire building invasions of North India, from the east as well as the west, passed through the vast swathe of Gangetic plains of what is today Uttar Pradesh. Control over this region was of vital importance to the power and stability of all of India's major empires, including the Mauryan (320-200 BC), Kushan (100-250 AD) and Gupta (350-600 AD) empires. After the Guptas, the Ganga-Yamuna Doab saw the rise of Kannauj. During the reign of Harshavardhana, the Kannauj empire was at its zenith: it covered an area extending from Afghanistan and Kashmir in the west to Bengal in the east and up to the Vindhyas in the south, with its capital at Kannauj. Even today many communities in various parts of India - from Kashmir, Rajasthan, Uttarakhand, Bihar to Bengal - boast of being descendants of migrants from Kannauj, reflecting its glory in the past. Aligarh • Azamgarh •Budaun. Bahraich • Ballia • Banda • Barabanki • Bijnor • Bulandshahr • Deoband • Etawah • Faizabad • Farrukhabad • Fatehgarh • Firozabad • Ghazipur• Gola • Gonda • Gorakhpur . Hameerpur • Kannauj • Khurja • Kulpahar • Kushinagar • Lalitpur • Modinagar • Mainpuri • Mahoba • Mathura • Mirzapur • Moradabad • Muzaffarnagar • Noida • Orai • Pilibhit • Raebareli • Rampur • Saharanpur • Shahjahanpur • Sultanpur • Sant Kabir Nagar.